After having watched a childish Groves in the build up to the fight, he truly showed his class on the night, out jabbing and landing numerous vicious right hands on Froch’s granite titanium chin. The commentator Jim Watt, a Murray Walker type was clearly loving Groves’ work and lamenting Froch’s poor jab, which only in his last fight against the viking Dane, had been praised so much. 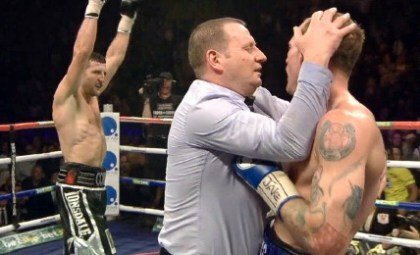 One thing is sure enough though, on Saturday, the Cobra was looking more like a grass snake..
Getting to the point of this mini-article, perhaps the stoppage was the best thing possible for Groves and the contrary for Froch. The fans have been quick to blast the referee. Groves has indeed the lost the fight in the literal sense, but in way he is the winner. What would have happened if the fight had continued we don’t know but we can make an educated guess that the Caveman would have given the not the saintly Groves a torrid time. If anything, Froch didn’t win the fight but Groves lost it with his inexperience. For all Groves attributes, he seemed to have forgot that he was fighting against Carl Froch. Looking for a knock out wasn’t a smart move. Finally this match was shades of the Derry Matthews vs. Tommy Coyle fight. Youth made a mockery an ageing fighter but experience is worth its weight in gold.